KAMAISHI, IWATE PREF. - “You’d better not,” says a member of staff at the Kamaishi Tourist Information Center when I tell her I’ll be hiking solo on the Hakozaki Peninsula in Iwate Prefecture. I assure her I carry a bear bell. 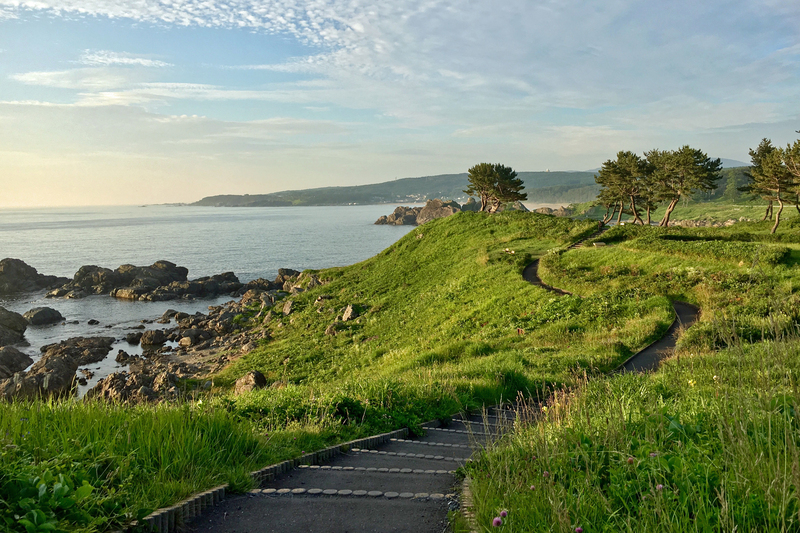 I am embarking on a solo adventure on the Michinoku Coastal Trail (MCT) — a 700-kilometer-long route that hugs the Pacific coast from Aomori Prefecture to Fukushima Prefecture. Over 16 days, I plan to tackle a shorter section of the route, starting from Kamaishi in Iwate Prefecture and ending in Ishinomaki, Miyagi Prefecture, to visit reconstruction projects in areas ravaged by the Great East Japan Earthquake in 2011. I first heard about the MCT from British-Japanese aid worker Robin Lewis. In August 2017, Lewis became one of the few hikers to complete the entire length of the trail and he documented his journey on his Explore Tohoku Facebook page. 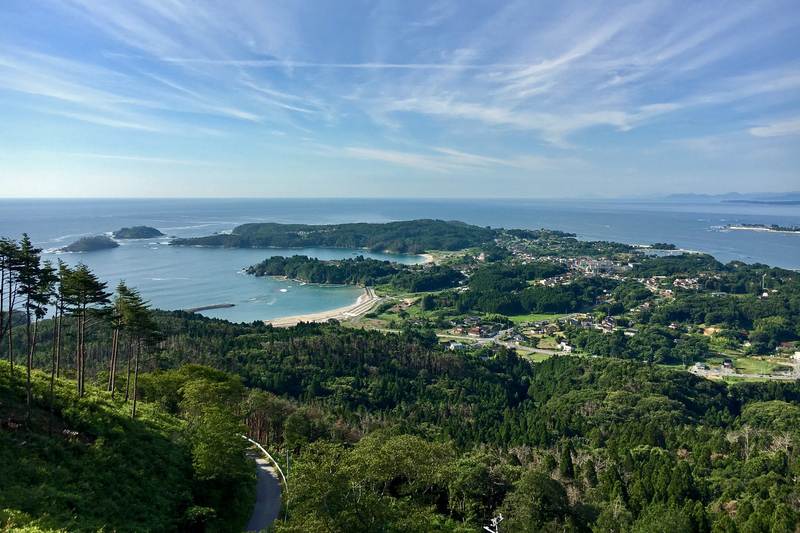 An initiative by Japan’s environment ministry, the route winds through protected forests, coastlines, bucolic villages and sections of the National Route 45 highway that runs through Tohoku (Michinoku is the ancient name for the region). Huge sections of the MCT fall under the Sanriku Fukko (Reconstruction) National Park, created in 2013 to rejuvenate the disaster-stricken area through ecotourism. 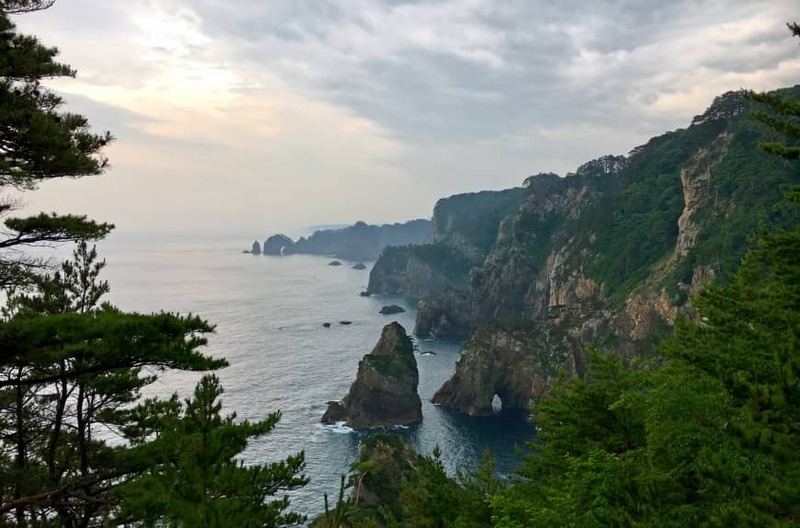 Dubbed the Alps of the Sea, the Sanriku coast boasts stunning palisades of natural rock, towering up to 200 meters high, sheer cliffs, dramatic sea caves and a jagged ria coastline. 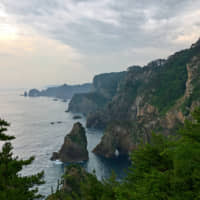 Along the Goishi Coast in Ofunato, I hike the 6-kilometer trail that runs along a rugged bluff above the ocean and meanders through a red pine forest with vistas of the sparkling turquoise sea. Blooming pink azaleas and dainty yellow and small white hamagiku (beach chrysanthemum) dot the trail, signaling the arrival of spring. The Goishi Visitor Center displays exhaustive information on the area’s geological wonders, rich flora and wildlife. Off the Tohoku coastline, the cold subarctic current intersects with the warm Kuroshio current to create a nutrient-rich habitat for marine life. Four of the largest fishing harbors in Japan — Hachinohe, Kesennuma, Ishinomaki and Shiogama — are located in this region. Pacific saury, coho salmon, oysters, awabi (abalone) and hoya (sea squirt) are just a sample of the wide array of seafood harvested here. At Petit Resort Marine Life on Tashirojima island, a short ferry ride from Ishinomaki, I devour a sumptuous 12-course meal of freshly caught mackerel, flounder, squid and shellfish sourced from local fishermen. Also known as “Cat Island,” Tashirojima is popular with daytrippers who come to see the stray cats that outnumber the island’s aging population. The trail also passes through city centers such as Rikuzentakata, where I sign up for a guided tour with Masayoshi Kouno, a guide from the Rikuzentakata Tourism Department. One of the hardest-hit areas in the 2011 disaster, the city center depicts the scene of a recent apocalypse. More than seven years on from the earthquake, vast empty spaces are inhabited only by bulldozers and trucks piling soil to raise the ground. A 12.5-meter seawall is still under construction and an abandoned three-story school building sports a sign that marks the height of the massive, 14.2-meter wave that engulfed the school. Miracle Pine: A replica of the last tree remaining along the Rikuzentakata coastline after the Great East Japan Earthquake in 2011. A replica of the “miracle pine” tree stands at a short distance from the school. 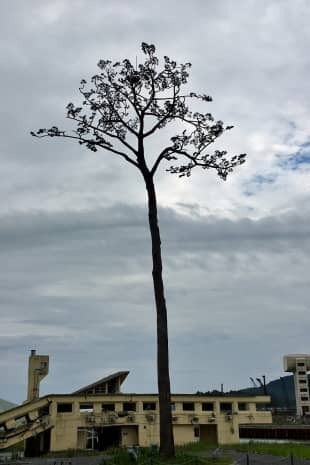 A symbol of hope and resilience, the lone tree survived after monstrous waves wiped out the 70,000 pine trees that once lined the beach front. Though the original died 18 months later from salt toxicity, the replica serves as a reminder for future generations. “Thank you for visiting us and not forgetting us, even after seven years,” says Kouno after our tour. It’s the serendipitous encounters with the kind and big-hearted Tohoku folks that form the most indelible memories of my journey along the MCT. At Houraikan, a ryokan (inn) in Kamaishi, next to the start of a section of the MCT trail, the front desk manager tells me to drop in after my hike just so she knows I’m safe. Three hours later when I show up, she brings out cookies and hot tea, even though I’m not a guest at the inn. During a three-day stay at a campground on the Karakuwa Peninsula, the genial park rangers at the Karakuwa Visitor Center invite me to join them for tea breaks with cakes and freshly brewed coffee each time I return from my day hikes. An obāsan (older woman) at Oshima Port Ferry Terminal shares her Castella cake and seemed more curious about where I come from than to share her experience of the tsunami. Instead of self-pity and despondency, I see renewed spirit and sanguine expectations in these folks. To reach the Michinoku Coastal Trail from Tokyo, take the Tohoku Shinkansen from Tokyo Station to Sendai, Ichinoseki, Shin-Hanamaki or Hachinohe stations. There, transfer to local train or bus lines, depending on where you want to access the trail. For more information on the Michinoku Coastal Trail and to download English trail maps, visit tohoku.env.go.jp/mct/english. For information on campsites and accommodation, visit the Japanese site at tohoku.env.go.jp/mct/route/information.html.